Cable assemblies are available from In2Connect. According to Wikipedia, a cable harness; also known as a wiring harness, cable assembly, wiring assembly or wiring loom; is a bundle of cables and/or wires used to transmit data/control signals or operating currents. The individual cables are bound together by clamps, cable ties, cable lacing, sleeves, electrical tape, conduit, expandable polystyrene tubing, etc. Commonly used throughout industry, custom cable assemblies provide several advantages over loose wires and cables. Most aircraft, automobiles and spacecraft will use wire harnesses, to secure and protect wires and cables against the adverse effects of vibrations, abrasions, and moisture. From the most complicated industrial or military electrical/fibre optic hybrid harness to the simplest computer interconnect assembly like RJ45 to RJ45, wiring harnesses optimise space and installation time. In2Connect have over 50 years experience in advising on specification and design of high performance cable harnesses to solve customers’ specific interconnect problems. To add value to our connector offering we can supply UK manufactured, 100% tested, labelled and bagged cable assemblies and will supply to the exact length required. EMC protection and optical fibres can be built into cable assemblies for use in military, aerospace, industrial, medical, data network and consumer applications. We have supplied radio communication cables to a major European defence force for both base stations and satellite uplinks. We are able to convert any of our connector products into cost-effective, QUALITY, cable assemblies ~ connector to connector, connector to open end, over moulded assembly or panel to almost anything, saving you TIME plus the cash outlay in expensive hand or automatic machinery or materials. For medium/high volume batches our Eastern European or Far East partners can provide fast and reliable manufacture to ensure ongoing cost effectiveness………….. There are obvious cost benefits when manufacturing products in countries with lower labour costs than those prevalent in more developed countries like the UK. Notwithstanding, unless you are accustomed to international trade, import logistics, excise duties and VAT at point of entry and dealing with unproven suppliers, it may not seem a sensible option. In2Connect has long developed links with reputable offshore manufacturing partners and thus can control quality and logistics for you. 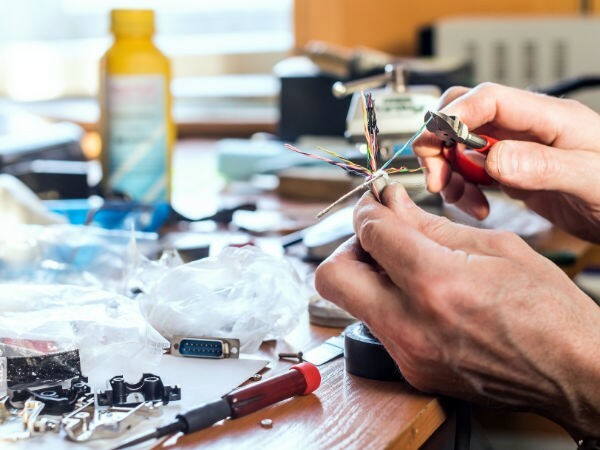 In2Connect can support you throughout your project ~ from an early design stage, advising on selection of connectors, cables and accessories ~ through prototype to full production. As well as Military harnesses we can supply assemblies containing both copper cores and optical fibres using either expanded beam or physical contact fibre connectors based on MIL-C 38999 shell. Outsourcing your harness build can get you from design to point of sale far more efficiently with a truly “plug and play” solution from a specialist sub-contract company.